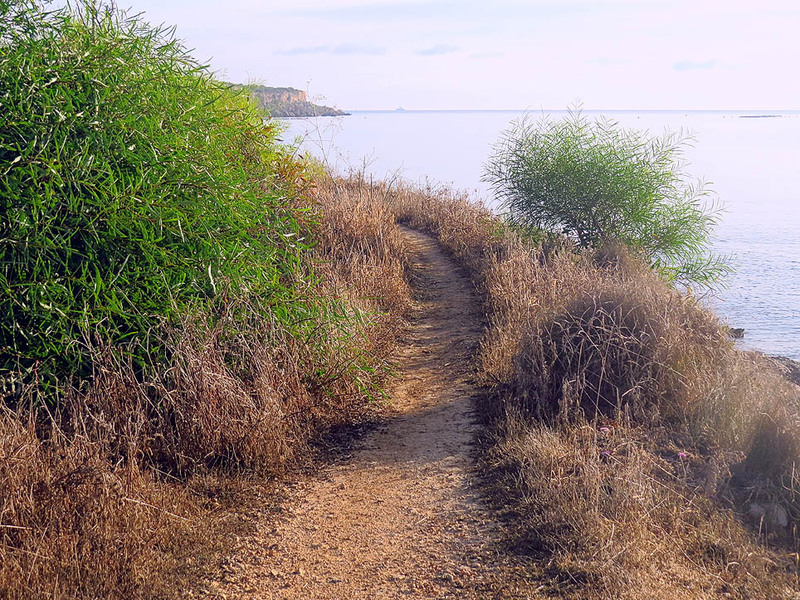 The Mellieha area offers several walking opportunities with a lot on offer in terms of the diversity of landscape. 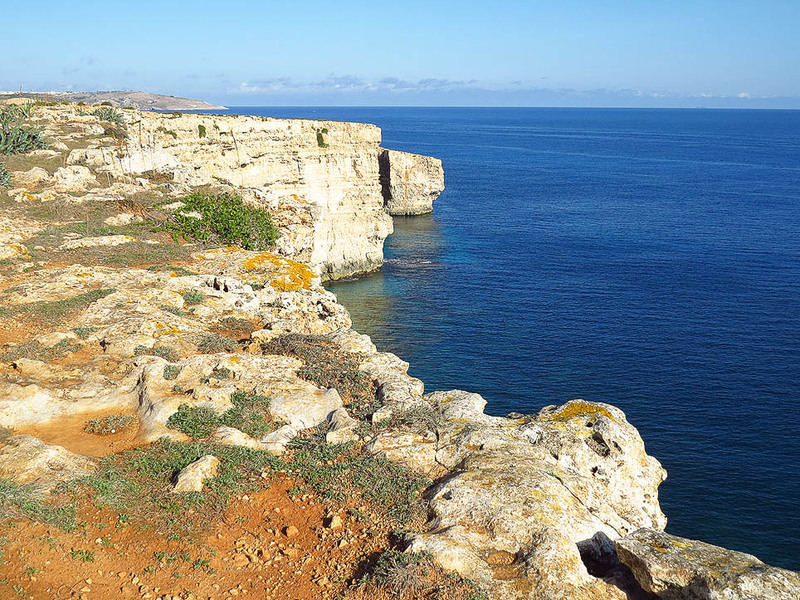 Just north of Ghadira Bay is a fairly easy walking route that covers Malta’s north-eastern promontory – known as l-Ahrax ta Gewwa. Starting at Ghadira one walks towards the Mellieha Bay Hotel – actually taking the small road that goes up to the hotel’s door. But continue on this short road until the end where there is what appears like a disused carpark. Beyond this is a copse of trees – go through it and walk some 30 metres to a coastal path which starts from here. This is easy enough to follow. 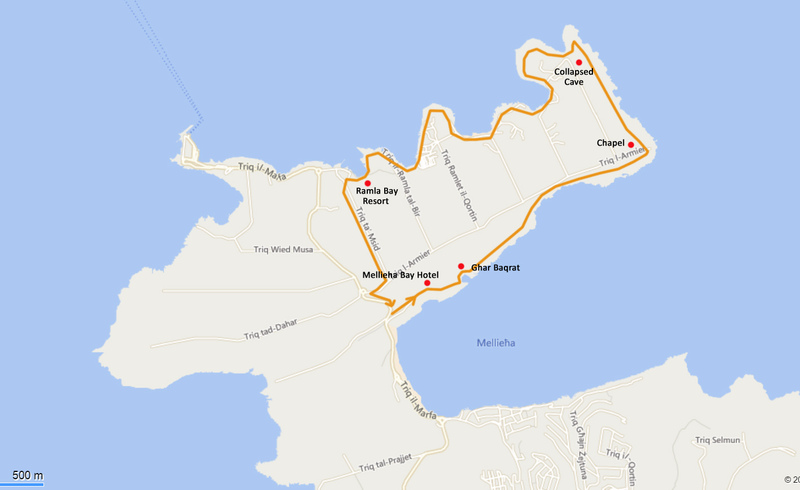 The first point of note is a small cove which comes up very soon. Going by the strange name of Ghar Baqrat (Cow’s cove) it is one of the prettier places along this coast – and one that few know about at all. From the cove the trail continues along a defensive wall – one of two built along this stretch – and dating from the last days of the Knights. The going remains fairly easy and the track soon starts running parallel and next to the road – making orientation all that much easier. At the end of the promontory is a small chapel – normally open at all times – dating from the early days of the twentieth century. The chapel replaced a previous one built much closer to the cliffs – so close that cliff erosion eventually resulted in its collapse. Nothing remains of this previous building. 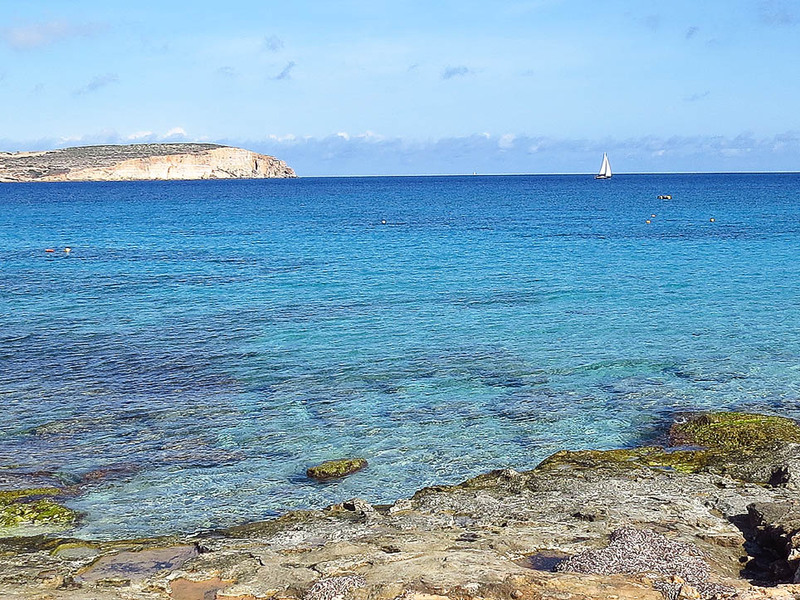 This stretch of cliffs – Rdum tal-Madonna – is a spectacular one, backed by a wood of pine trees and with open sea views and glimpses of Comino and Gozo to the north. At the far end of this stretch is an interesting collapsed cave which now looks like an inland stretch of water punched in the cliffs. This is a favourite magnet for divers and canoers. Where the cliffs end it is time to turn left (well – there is no other turning other than back) along a series of small coves and beaches. The sea in this area is among the more translucent in Malta – with shallow waters lapping over white sands. 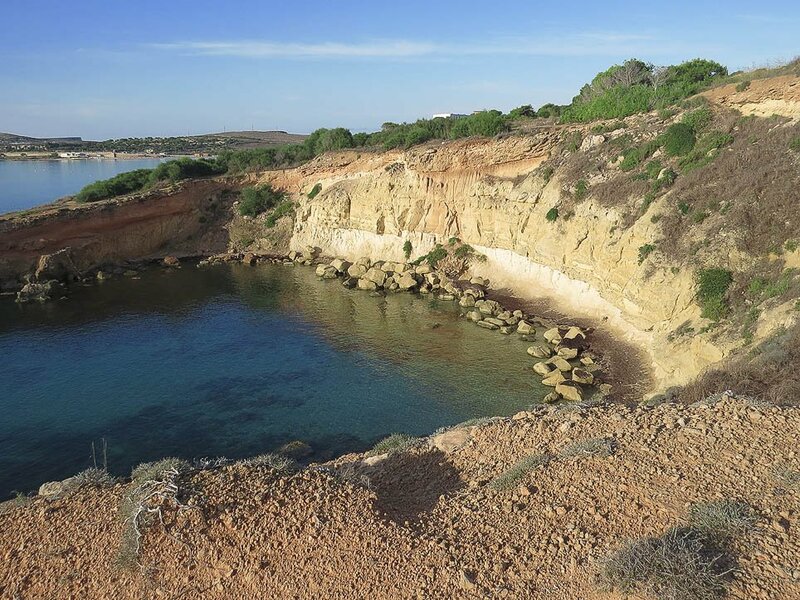 It is perhaps for this very reason that quite a few Maltese have summer shacks along this stretch of coast – a lot of them built illegally over forty years ago. Efforts to dismantle these structures in the past eventually gave way to political inertia and this ‘summer village’ now seems very much here to stay. The summer houses vary from (almost) pretty well kept ones with shady verandas to ones that are literally converted cargo containers. There are also a half dozen or so lidos which double up as restaurants or snack bars along this stretch of coast. A few remain open in the winter months when they are blissfully quiet places for a beer or two. The last cove is next to the smart and spacious Ramla Bay Resort – and from here a scenic country road leads back to Ghadira. The trek takes from two to three hours to complete and is a very easy one for most of the way.